AAHKS members Rafael J. Sierra, MD and Carlos A. Higuera, MD join SOTU President, Rogelio Rey, MD (center) at the 20th Congress of the Uruguayan Society of Orthopaedics and Traumatology happening now in Montevideo, Uruguay. 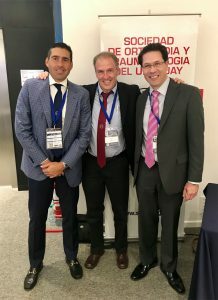 AAHKS was represented this week at the co-branded meeting with the 20th Congress of the Uruguayan Society of Orthopaedics and Traumatology in Montevideo, Uruguay. AAHKS International Committee Chair Rafael J. Sierra, MD provided the AAHKS 2017 Annual Meeting Highlights presentation, in addition to other discussions. AAHKS Member Carlos A. Higuera, MD was also on the program with more than half a dozen papers. AAHKS hosted a membership booth and a members-only luncheon at the Congress. View the program.